Nigeria Contained Ebola; Can We Contain Lassa Fever and Zika Virus? On the 14th January 2016, the World Health Organisation declared an end of the Ebola outbreak in West Africa. Less than a day later, a new case in Sierra Leone was detected, indicating that the path to eradication must be paved with vigilance and patience. Indeed, Nigeria -- my home country -- was among the first West African nations to contain the recent Ebola outbreak, as a result of rapid action, resilience and resources, and widespread health education. Lessons from our fight against Ebola can be applied to the recent outbreak of Lassa fever in Nigeria, which has already claimed 40 lives, with almost 100 reported cases in at least 10 states. The Wellbeing Foundation Africa (WBFA) and I have taken rapid steps to elevate awareness of this deadly disease and its prevention, in line with our health education efforts across Nigeria. Our strong health education platform, #MaternalMonday, is designed to engage and empower individuals on a range of health issues related to health. In light of warnings from the World Health Organisation, WBFA and I have taken steps to educate women globally about Zika Virus and the risks that the virus poses to their health and the health of their children through our #MaternalMonday campaign. We believe that through health education and rapid awareness efforts, we can prevent an outbreak from turning into an epidemic. An acute hemorrhagic fever caused by the Lassa virus, Lassa fever can be transmitted through contact with an infected rodent or contact with the bodily fluids of an infected person, including mother-to-child transmission and consumption of infected food items. Pregnant women, especially those in the third trimester of pregnancy face a higher risk of contracting the disease -- which causes mortality in 95% of cases. As studies have indicated, the increased likelihood of mortality at this stage of pregnancy is due to immunosuppression associated with the third trimester of pregnancy. To prevent Lassa fever, WBFA have produced an infographic on the importance of hand-washing and rodent control, while warning against contact with infected bodily fluids. In light of the prodigious threat posed by Lassa fever to an already fragile public healthcare system, WBFA and I will also facilitate capacity building for healthcare workers, especially in the areas of reproductive, maternal, newborn, child and adolescent health (RMNCAH), in order to minimize morbidities and mortalities resulting from the disease, especially among vulnerable women and children. Moreover, we will be folding in Lassa fever prevention tips into our #MaternalMonday antenatal health education classes, delivered to expectant mothers across Nigeria to encourage rapid action, awareness, and behavior change amongst patients, so as to stem the spread of disease. Through our Alaafia Universal Health Coverage Fund (AUHCF), we are scaling up access to primary healthcare and building an effective infrastructure for the provision of primary health services, as a solution to containing and preventing future epidemics. 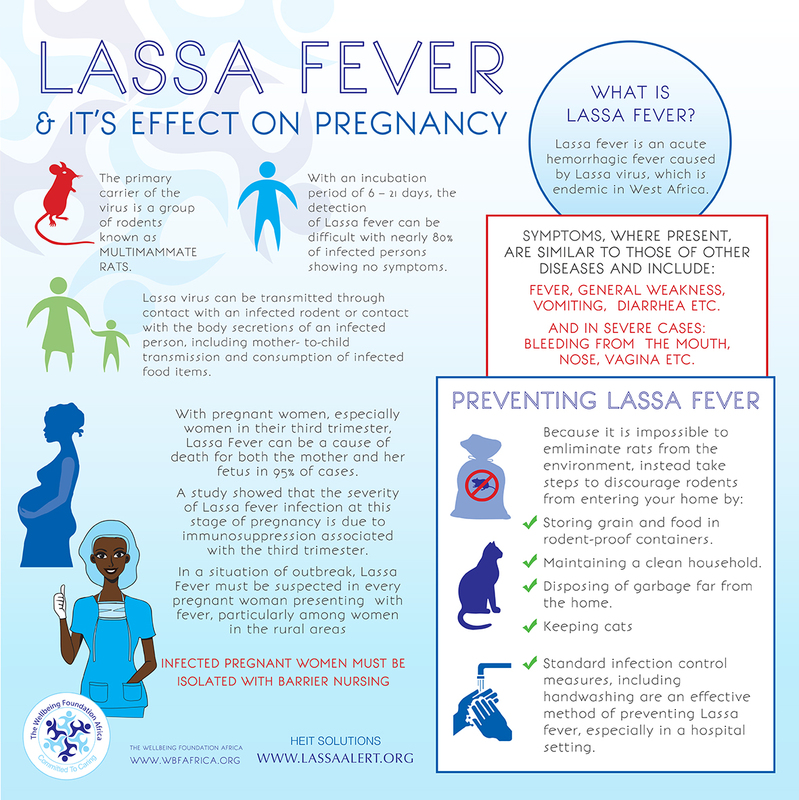 For information on Lassa Fever, check out our infographic below!